Now I know you’re probably waiting for No Man’s Sky to get your deep space fix, but Everspace actually looks really great and is offering something a bit different. Plus, you can actually play the beta now, if you throw some money at it. Delve deeper into the cosmos with our list of PC’s best space games. A few years back I was complaining about the lack of space games, and now there are loads of them. 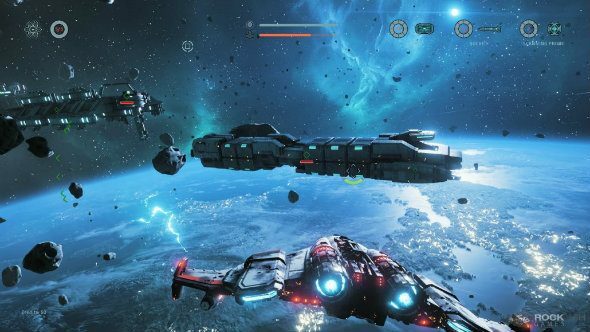 Three of the biggest are focused on recreating the feeling of freedom and limitless exploration the vastness of space would offer, but Everspace is more about exciting space battles and that’s kinda refreshing. It also looks amazing. Honestly. Just look at it. There’s obviously an audience for this sort of thing, as Everspace has become the most funded German game on Kickstarter, and that’s not counting what’s been raised through the game’s website. If it looks like the sort of thing you’d back, you can still throw money at the project on the Everspace site. Choose the right tier and you’ll get access to the closed beta which is running currently. Let us know if you’ve had a crack. I want to know if it’s as great as it looks.